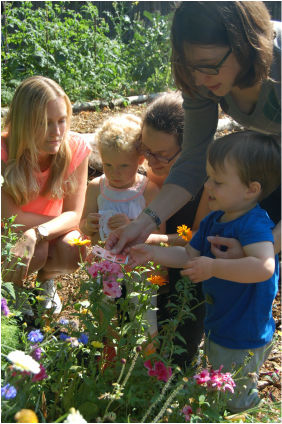 Bugs Club is a fantastic opportunity to get the kids interacting with nature, learning and playing in our spontaneous outdoors classroom. When: We'll be starting back on 21st March, then once a month, every third Sat of the month until Sept 11-12:30, rain or shine! How to join: No need to book, just show up on the day. The aims of the project are to attract wildlife and further biodiversity to the Edible Garden while offering children outdoor learning about the natural environment, and the origin and processes involved in the food on their plates. The children also learn to help each other as participants in a community project. Companion planting, where one plant benefits from the proximity of another, usually for the purpose of attracting beneficial bugs or repelling damaging ones. NOTE - if it is raining heavily Bugs Club will be cancelled at short notice - if it's drizzling or there are dark clouds, check our facebook group for updates from Charlotte.